Las Vegas City Hall is located at 495 South Main Street, Las Vegas, NV 89101; phone: 702-229-6011. Photo: John Dayton Smith House, a Mission/Spanish revival house built ca. 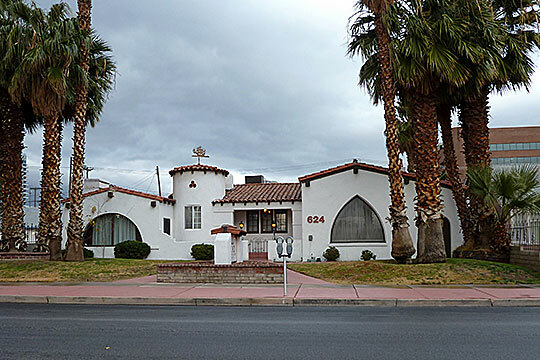 1931 at 624 South 6th Street, Las Vegas, NV. Listed on the National Register of Historic Places in 1987. Photographed by User:Bobak Ha'Eri (own work), 2010, [cc-by-3.0 (creativecommons.org/licenses/by/3.0)], via Wikimedia Commons, accessed June, 2013. The first settlement in the Las Vegas valley, commonly referred to as the Mormon Fort was established in 1855. The Mormons had traveled from Salt Lake City, Utah to the Las Vegas valley in order to establish a mission and a rest stop on the existing trade route to Southern California. The settlers constructed a fort located at the southeast corner of present Las Vegas Boulevard and Washington Avenue. However, the mission was not as successful as the settlers hoped, and the Indians frequently raided their fields to steal the crops. In 1857, the Mormons abandoned the fort due to internal dissension regarding leadership and failed attempts to mine useable lead from Mt. Potosi, 35 miles to the southwest. The Mormon Fort lay abandoned and at the mercy of passing travelers and Indians who stole lumber and supplies until 1860 when a California party of prospectors rediscovered the Potosi mining area. The miners formed the Colorado Mining Company and used the fort until the outbreak of the Civil War in 1861. The fort remained largely unused until a former miner named Octavius Decatur Gass and two partners took over the site to raise cattle and recultivate the deserted fields. As the fort was largely in ruins, Gass and his partners rebuilt the original adobe building and constructed another, which Gass eventually lived in with his wife and family. In the 1870s Gass bought out his two partners and continued to farm and raise cattle on the 640 acres. The fort was eventually named the "Las Vegas Ranch," and became a rest stop for weary travelers where they could camp and obtain a decent meal for a nominal fee. Archibald Stewart and his wife, Helen, moved to the Las Vegas Ranch in 1882 and began a prosperous ranching operation until 1884 when Stewart was killed under suspicious circumstances at the neighboring Kiel ranch. As a widow with five children, a member of the School Board and women's club leader, Helen Stewart continued operating the now 2,000-acre ranch and farm for another 18 years, becoming the largest landowner in Lincoln County. In 1902, the newly formed San Pedro, Los Angeles and Salt Lake Railroad became interested in a portion of the Stewart land and began searching for a qualified surveyor. John T. McWilliams was born on December 10, 1863 at Owen Sound, Ontario, Canada. His father, an Irish immigrant named John McWilliams, was a building contractor who taught John surveying skills. Aspiring to be an engineer, young John moved to the United States in 1879 to attend University of Chicago. Within a year, he was employed by the Northern Pacific Railroad in its engineering corps. In 1879, the governor of South Dakota appointed him a delegate to the National Irrigation Congress in Los Angeles, which introduced him to the western United States. When the conference concluded, McWilliams decided to tour the region where he found plenty of work as a surveyor. His work brought him to Needles, California, where he met his future wife, lona, eventually moving to Goodsprings, Nevada in 1901 with their newborn baby girl. It was here that McWilliams was living when summoned by William McDermott, a representative of the San Pedro, Los Angeles and Salt Lake Railroad, to survey Helen J. Stewart's 1,840 acre Las Vegas Ranch in 1902. The railroad was financed by Montana Senator William Clark, for whom Clark County is named, with ownership held by Clark's Las Vegas Land and Water Company. The railroad was considering the Stewart land for a new townsite and railroad division point, eventually purchasing much of the ranch from the Stewarts in 1902. McWilliams had been to the area previously, when in 1894 he surveyed and made claim to approximately 1,300 acres of heavily forested land at the Spring Mountains, specifically Lee Canyon, located northwest of present Las Vegas. He was well aware of the valley's huge artesian water belt, and seeing opportunity, purchased 80 acres of land from the Stewarts. In 1904, he began laying out an orderly townsite, which he called the "Original Las Vegas Townsite," and selling lots. When the railroad was completed through Las Vegas that same year, McWilliams' land was on the west side of the tracks. Not willing to share the profits of a new town, the Las Vegas Land and Water Company began to lay out a townsite of its own on the opposite side of the tracks from McWilliams' land and auctioned off the lots that same year. The townsite, called "Clark's Las Vegas Townsite," boomed almost overnight with lots selling at the May 1905 auction for as much as $1,200. Almost half of the 1,200 lots sold in one day, purchased mostly by speculators from Los Angeles and Salt Lake City. The most valuable lots were closest to the train depot located at the intersection of Main and Fremont Streets. The depot, and consequently the freight loading and unloading ramps, were located on the east side of the tracks, making it difficult for carts to cross over the embankment. Most importantly, the railroad owned nearly all the water from Big Springs, the source of Las Vegas Creek. Clark's Las Vegas Townsite came with the promise of water, eventually forcing many of the early residents of the McWilliams' townsite, which was served by several small shared wells, to place their buildings on skids and move across the tracks to Clark's Las Vegas Townsite. The first plat for the Original Las Vegas Townsite was filed with then Lincoln County, Nevada on January 13, 1905. The boundaries were First Street and Eighth Street on the west and east, respectively (now A Street and H Street), and Clark Avenue and the north side of Stewart Avenue on the south and north, respectively (now Bonanza Road and Morgan Street.) The site was located northwest of Clark's Las Vegas Townsite, with the railroad running through the lower southeast corner at A Street and Clark Avenue. Each block had 24 lots, with 12 running north/south and 12 running east/west. A 20-foot-wide T-shaped alley separated the lots into three groups. The north/south lots were typically 25 feet wide, and 125 feet long. The east/west lots were typically 25 feet wide, and 140 feet long. By all rights, McWilliams' Townsite should have been a huge success. It was close to Las Vegas Creek, and accessible to roads to the surrounding mining communities of Rhyolite, Goldfield and Tonopah. For some time the townsite prospered, with lots selling well through the winter of 1904-1905, reaching a peak of 2,000-3,000 residents. It served as a transportation hub for mining supplies and goods brought by the railroad, with dozens of freight wagons leaving daily for the outlying mining districts. McWilliams built his house there, and by May of 1905, it had the valley's first bank, blacksmiths, wholesale houses, a bottling works, drug and general stores, and several good restaurants. Disaster struck in September 1905 with a series of fires that destroyed almost all of the wooden structures in town. Until the 1930s, the townsite consisted of little more than tents and shacks. When McWilliams was appointed State Water Rights Surveyor for the region in 1906, the residents of Clark's Las Vegas Townsite were already referring to it as "Ragtown." Clark County was carved from Lincoln County in 1910, and Clark's Las Vegas Townsite became an incorporated city, Las Vegas, adopting its first charter on March 16, 1911. At the time of incorporation, the city encompassed 19.18 square miles, and had approximately 1,000 inhabitants, less than 1 percent of the state's total population. Fremont and Main Streets developed as the main commercial arteries of Las Vegas. Main Street ran parallel along the east side of the railroad tracks and the majority of the businesses were dedicated to the railroad. Fremont Street became the town center with a bank, post office, and retail shops. Nightclubs and speakeasies flourished, even during Prohibition, on the infamous Block 16 located one block north of Fremont Street. McWilliams' Townsite became a subdivision of Las Vegas, and in 1916 began to demand water services from the railroad's land and water subsidiary. The Las Vegas City Commission passed a resolution that year asking for compliance from the railroad. At the time, the Westside was developing slowly, with little more than tents and a few permanent homes. There was no protection from fire because with no water lines, there were no fire hydrants, forcing firemen to run a hose from Las Vegas. Courtney Mooney, City of Las Vegas Planning and Development, Clark Avenue Railroad Underpass, Clark County, Nevada, nomination document, 2003, National Park Service, National Register of Historic Places, Washington, D.C.